Mission San Miguel Arcangel was the sixteenth Spanish mission built in California, founded July 25, 1797, by Father Fermin Lasuen. The name San Miguel comes from Saint Michael, Captain of the Armies of God. Mission San Miguel is the only one with unretouched original paintings. It was the last to be secularized. 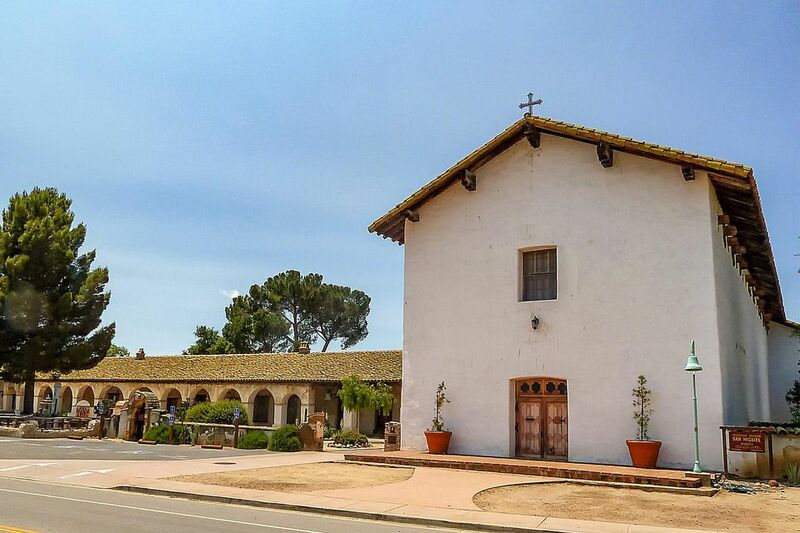 Where Is Mission San Miguel Located? Mission San Miguel is at 775 Mission Street in San Miguel, CA. You can get their hours and directions at the Mission San Miguel Website. On July 24, 1797, Father Fermin Lasuen founded his third mission of the year. It was next to a large Salinan Indian Village called Cholam or Cholami. Halfway between San Luis Obispo and San Antonio, it made a convenient place to stop along the El Camino Real. Salinan Indians heard about the Catholic Fathers before they came and were anxious to join them. At the founding, 25 children were baptized. Father Buenaventura Sitjar was the first administrator. Father Juan Martin took his place. By the end of the first year, Fathers and Indians had built a 71-foot-long brush fence, an adobe chapel, and a house. More than 1,000 neophytes were at the mission by 1803. By 1805, there were 47 Indian houses. Despite poor soil and hot climate, San Miguel Mission succeeded. Indians came to live and work. Some worked in fields and vineyards or were herdsmen. Others learned to be carpenters, stone masons, blacksmiths, weavers, soap makers, and leather workers. They were good at making roof tiles and made 36,000 of them between 1808 and 1809. In 1806, a fire destroyed most of San Miguel's buildings and supplies. Other missions helped them recover. By 1810, San Miguel had 10,558 cattle; 8,282 sheep and 1,597 horses. Father Martin died in 1824. His assistant Father Juan Cabot took over. In 1827, Father Cabot reported San Miguel owned several ranchos covering an area18 miles north and south, 66 miles east and 35 miles west. He also reported it had an adobe house on the coast at San Simeon. At a hot spring south of the mission, Father Cabot had a shelter built where the Indians could soak and get relief from arthritis, a common ailment. San Miguel Mission was the last to be secularized, on July 14, 1836. Three years later, most of the natives were gone. Father Abella, the last Franciscan Father there, died in 1841. In 1846, Mexican Governor Pio Pico sold the land and buildings. The new owner lived in it and had a store there. After the Gold Rush, it was a stopping place for miners traveling from Los Angeles to San Francisco. It was also used for a saloon. In 1878, the Catholic church returned. Father Philip Farrelly became the first pastor. In 1928, the Franciscan Fathers returned. After earthquake damage in 2003, the old mission has now been repaired. The original church was destroyed in a fire in 1806. In 1808, the fathers built a granary, carpenter room and a sacristy. In 1814, construction began on a new church. It was soon ready for its roof, but it took a long time to bring the roofing timbers from the nearby mountains, 40 miles away, and the church was not completed until 1818. The building is 144 feet long, 27 feet wide and 40 feet tall, with six-foot-thick walls. The church's exterior is quite plain, and its architecture is simple. However, it is elaborately decorated inside with frescoes. An unusual feature is the "all-seeing eye of God" design above the altar. The screen on the wall behind the main altar is called a reredos. You can find out about it and more terms in the California mission glossary. The pulpit is typical for a church of the period, raised above the floor to make it easy to see. This picture shows the sounding board that hangs above it to reflect the priest's voice downward toward the congregation. The frescoes at Mission San Miguel are some of the most beautiful and best-preserved of any California mission, especially after their restoration in the early 2000s. The original paintings were done in 1820-21, painted by the mission Indians, working with Spanish diplomat and artist Esteban Carlos Munras of Monterey. The style is called neoclassical, and the painting is sometimes called trompe l’oeil which means "fool the eye." Besides the blue columns you see here, the wall decorations include fake fabrics and marble. This cemetery contains some very interesting markers, for people from all over the world who were buried at San Miguel in the late 1800s. You can see these bells from the cemetery, atop a long wall section behind the main church. The structure they hang in wasn't part of the original mission but was built in the mid-1930s by Jess Crettoll, a stonemason from Switzerland. The largest bell is said to weigh 2,000 pounds and was made in 1888 by melting and re-casting six cracked and broken bells from other missions. According to the mission website, Father Mut raised money to have the bell made, a total of $653, which would be more than $15,000 today. Read more here. This kitchen is part of the museum, which is open for tours daily. This outdoor oven is typical of those you'll see at many California missions, as is the cart in the background. Both show what things were like during the mission days. The olives were harvested and put into net bags; then the bag was placed between the two boards near the bottom of the press. As the mechanism in the middle turned, it pressed the bag, and the olive oil ran out into the trough below. Mission San Miguel never had a formal bell tower like other missions, and for most of its history, the bells hung from simple wooden structures. The original bell cracked, and Mission San Antonio loaned them this one, cast in Mexico City in 1800. It is inscribed "S. S. Gabriel A. D. 1800." This mission bell now hangs in front of the mission, under one of the arches. These days, it's covered with netting to keep the birds off, but we caught this picture of it before they installed the nets. The Mission San Miguel picture above shows its cattle brand. It was drawn from samples on display at Mission San Francisco Solano and Mission San Antonio.